Every week since moving to Mexico by myself, I am asked if I have seen a particular town or famous tourist destination; the Frida Kahlo Museum or the Mayan ruins. I have to guiltily shake my head no. I distinctly remember its passing, that need to sight-see. It was ten years ago and I was walking down Strawberry Street in Richmond, Virginia, having just finished a cheeseburger at the iconic Strawberry Street Cafe. No longer winter and not yet spring, wet leaves still matted the streets and the dogwoods were just beginning to bud. Out of nowhere, to my surprise and horror, I became conscious that I had lost my interest in travel. When I even hinted to friends that I was not that motivated to go anywhere, their reaction was what I’d expect if I had said I had never taken a taxi. These days to divert them from this social flaw, I pepper them with questions about their trips, about what they saw and how they chose the destination, still hoping to fire up the desire and feeling a bit panicky in its absence. I hear about the tours, the scenery, the views. I remember that my grandmother used to watch television travel shows. Years later she became convinced she had actually been there. Like in the movie Total Recall (the 1990 version with Arnold Schwarzenegger) she remembered in vivid detail places she'd never been. Even then I thought that was very cool. Maybe I could do that instead of going to all that trouble packing, spending, waiting and sweating. I have however over the last few years in Mexico spent several hours discussing in a language not my own the transforming qualities of loss with a Mexican whom I had only just met minutes before. I have had numerous hilarious “Is-it-Mexico-or-is-it-just-Juan (Alejandro, Jesus, or Ricardo)?” debates with my expat girlfriends. I have piloted a little ferry boat for my friend Felipe to the lone sound of fish breaching the water in the darkness along the tiny inlet of El Cid. These are the kind of things you do when you've established a relationship, not a fleeting two-week affair from an AirBnB rental. Scuba diving years ago in the Florida Keys, I remember my PADI instructor telling the students not to swim too hard when far below the surface. He told us that if you breathe normally and sit quietly, beautiful fish will get used to you being there and they will swim much closer to you. If you are swimming hard, they will dash away. When I travel through a place, rather than live in it for a time, that's how it feels - that its intimacy is beyond my grasp. Whenever I think that I might be beginning to feel that mobilizing rush, that restlessness to travel to places that I won't ever call home, the urge slips through my fingers like water. Most recent: Maybe you haven't thought about how today's online banking services would make your life in another country so much more worry-free than in years past. 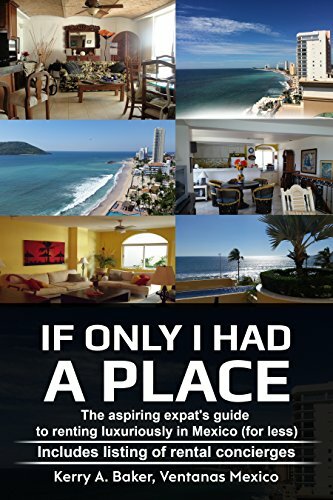 Kerry Baker is a partner with Ventanas Mexico, which provides resources for those considering part or full-time life in Mexico, like "If Only I Had a Place," a guide for finding your temporary home in Mexico. It includes a listing of concierge rentals. She wrote the "Interactive Guide to Learning Spanish Free Online," linking you to the best of the web (with lesson plans) with insights on why you should get started today, along with "If Only I Had a Place," a guide for the aspiring expat seeking to live large in Mexico.